Jake Spiegelhauer grew up in Huntsville, TX, attending Huntsville schools and graduating from Huntsville High School. He went on to attend Texas A&M University, receiving his B.A. in 2001 and his M.A. in 2004. Following a stint as a writer, Mr. Spiegelhauer then went on to pursue a career in law, graduating first in his class from Baylor Law School in 2012. He then returned to the Bryan-College Station area to pursue his law practice with the James & Reynolds Law Firm in 2013. During his time at the firm, Mr. Spiegelhauer has represented clients with charges that have ranged the full spectrum - from Class C Misdemeanors to 1 Degree Felonies. To maintain his skill and knowledge of the law, Mr. Spiegelhauer regularly attends seminars and classes throughout the state. 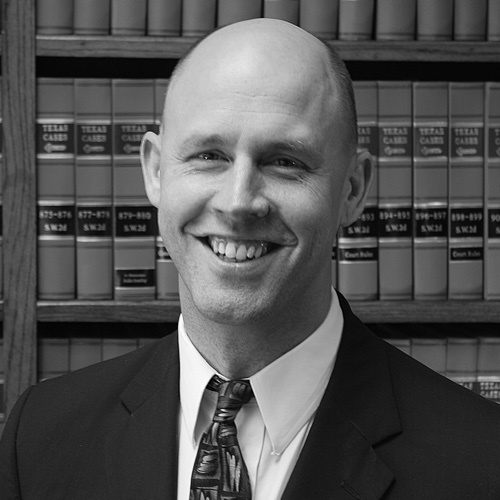 In his practice, he has served as both lead and co-counsel on felony and misdemeanor cases - including murder, sexual assault, and aggravated assault cases. Mr. Spiegelhauer has successfully obtained multiple acquittals in jury trials held in both district and county courts. He has also handled several appeals in the 10" Court of Appeals in Waco, TX. He has also represented many individuals in post-conviction writ of habeas hearings across the State of Texas. Call, email, or message Jake.